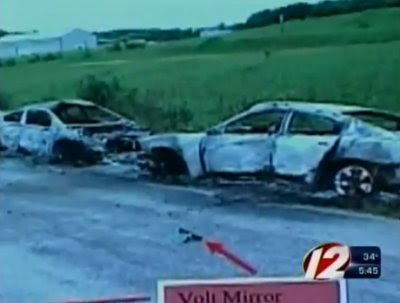 Volt Vehicle Fire: What Did NHTSA Know And When Did They Know It? The witnesses [included] National Highway Transportation Safety Administration (NHTSA), Barack Obama-appointee Administrator David Strickland... [and] General Motors (GM), Barack Obama-appointee CEO Dan Akerson. ...This hearing was all about a single June Volt blaze. The battery burst into flames about three weeks after a test crash at and by the National Highway Transportation Safety Administration (NHTSA). A fire about which Obama’s NHTSA did tell the Obama White House. But a fire about which neither Obama’s NHTSA, the Obama Administration nor Obama’s GM told the American people for nearly six months – and then did so only when forced by a looming Bloomberg news story. ...Joan Claybrook, a former administrator at NHTSA believes part of the reason for the delay was the “fragility of Volt sales.” Yet she also believes that “NHTSA could have put out a consumer alert, not to tell them [customers] for six months makes no sense to me.” ...For Obama, notifying Americans of their potential immolation-by-Volt is of less import than his keeping his gig past November. The one NHTSA Volt fire discussed at the hearing was not the only NHTSA Volt fire that occurred. In November, there were two others. After conducting three different tests two weeks ago, the NHTSA found that the Volt’s battery either caught fire or began to smoke in two out of the three. So that’s three Volt fires – all in the hands of the Obama Administration, all after crashes... There were [also] three other, private-owner Volt fires. None of which involved Volts that were in crashes. ...We still have no idea what caused these fires. The only thing we do know is that they were not caused by crashes – because these cars were never in crashes. 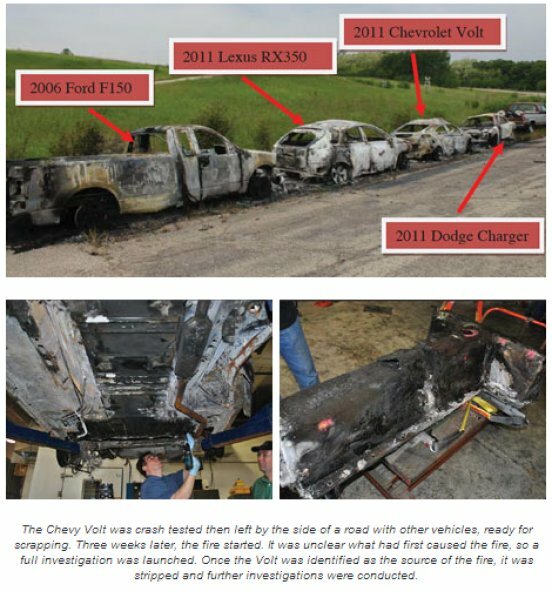 So why did Obama’s NHTSA, the Obama Administration and Obama’s GM singularly focus on (but one of three) post-crash Volt fires ... [w]hen none of these three privately-owned combustible Volts had been in accidents? We – still – don’t know. Anything. But don’t worry: The Obama Administration has declared that the Obama-owned GM Chevy Volt is perfectly safe – just in time for Obama’s reelection campaign. Indeed. The Volt is safe. We guarantee it. Who's we? Shut the hell up, peons. But wait, didn't Toyota's CEO have to come all the way to the Senate from Japan to get harassed for a couple imaginary sticking gas petals? Shouldn't we expect to see GM get the same treatment. HAHAHA just kidding.